To run great looking Live or On-Demand webinars directly inside a Hubspot landing page please follow the instructions below. To download the Automated webinar workflow templates to your HubSpot account you must be logged in to HubSpot and then follow the link below. Alternatively you can download the pack direct from the HubSpot Marketplace within the 'Create Events' section of your WorkCast account. The link takes you to the HubSpot Marketplace where the event templates are available. By clicking the 'Get pack for free' this will download the webinar templates and install them within your HubSpot account. Within your WorkCast account you will need to create a HubSpot embedded event using the downloaded template. 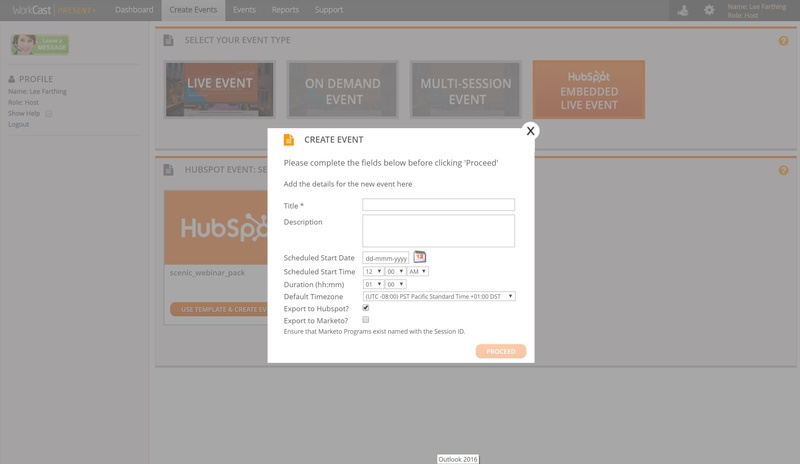 Simply select 'Create Event' within WorkCast and then choose 'HubSpot Embedded Live event'. You can select the downloaded template and give the Webinar a Title, Date and Time. This will automatically create a registration landing page, registration confirmation landing page, main event landing page and workflow within your HubSpot account. You are now able to amend the webinar copy as you desire from within HubSpot. Multiple items are created automatically but you are able to amend many aspects of the Registration Page, Confirmation Page and the Live Webinar Page. Within WorkCast we display your HubSpot URL's for easy access to edit. Add CTA's to white papers, links or downloads to any of the pages. Set up your broadcast in WorkCast and then you are ready to rehearse and present. Interested in a FREE 14 Day Trial? You can signup here for a free trial of HubSpot today!